Major Price concession now is the time to purchase a great boat! 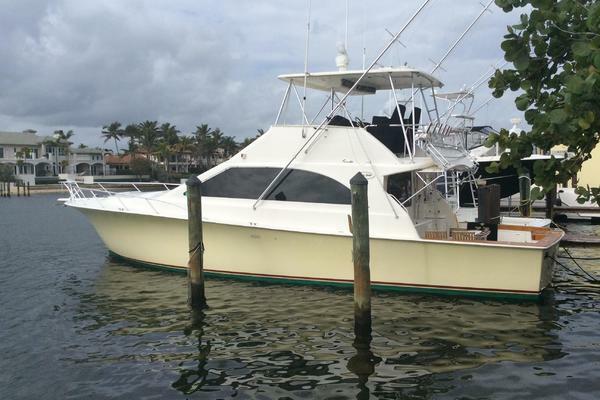 The last of the solid fiberglass hulls, and an exceptional example of the popular Post 46' Convertible Sportfisherman, "Black Eagle" has been consistently and thoroughly maintained by her original ownersince he bought her brand-new. Never fished, she has been maintained to yacht standards, from beautifully varnished exterior teak to a spotless engine room. 2014 survey available upon request.All recommendations addressed by Hodgdon Yacht Services in Southport, Maine, the yard at which she has been cared for and spent wintersinside heated storage her entire life. United Yacht Sales New Jersey would love to guide you through a personal showing of this 46' Post 46 1987. This yacht for sale is located in Boothbay, Maine and priced at $130,000. For a showing please contact us by filling out the form on this page and we will get back to you shortly! Varnished teak bulkheads throughout.Master stateroom offers a regal 6'5" long island berth, with easy access to either side. Headroom in this cabin is 6'7".Master head is accessed privately from the master stateroom. Headroom is 6'5" in the head and 6'3" in the separate shower stallGuest stateroom is to stbd with 6'7" upper berth and 5'8" lower berth. Headroom is 6'4".Guest head is accessed privately from the guest stateroom. Headroom is 6'3" in the head and 6'5" in the separate shower stall.Main salon is spacious and bright with large windows to port, stbd, and aft. A 6' long L shaped dinette is fwd to stbd, convenient to the galley for serving meals, or simply relaxing with a book or drink. A 7'4" L settee is aft to port and pulls out to create a double berth. A large door aft with a window opens to the cockpit.